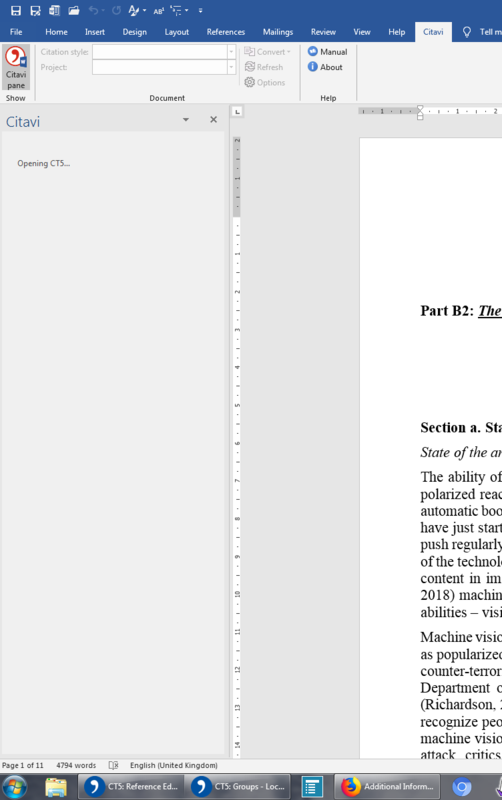 I don't see these changes reflected in Citavi's add-in in Word, even after pressing the "refresh" button. Is this normal behaviour? Would you please install the update to the current version of Citavi (6.3)? If you don't see an automatic update notification in Citavi, you can download the Setup from https://www.citavi.com/download. Double-click the Citavi6Setup.exe file to start the installation. Your Citavi projects, license key, and settings will not be affected by the update, and it's not necessary to uninstall Citavi before installing the update. After installing the update, the error should no longer occur. If it does, please let us know if you are working with a local or a cloud project. I'm working with a local project. Is your project saved on your computer or a network drive? As we could not reproduce the issue, we were wondering if you could send us a log file from the Word Add-In? This will help us better find the source of the error. Hello, the situation has significantly deteriorated. The addin doesn't load the project at all anymore. I just have a black left pane. I sent you a log report through the interface as you suggested in the last post. Would it be possible to solve this matter quickly? I'm working on a tight deadline and this comes really in the worst moment... Thanks! Could you please check cause 1 and 3 in this FAQ article? Just to explain: I click open project "CT5", it loads then stays like this without loading further. Jana, I have a very large project, with more than 8,000 references. It's almost 10 years of work in there. The problem might be that I recently imported 5449 references from a previous database (2 days ago). I cannot revert to a previous version however, because I did some very valuable work in Citavi over the past 2 days. 2. I think doing it manually will take ages. 3. I am currently freeing up space with the disk cleaner, I'll see if that does the trick. 4. If not, is there a way for me to send you the project file so you could take a look? In case your project will still be not opened in Word after the disc cleanup, kindly send me your project. So that we can match the files to the issue, please include the ticket ID 67932 in the message field of the upload form. The windows cleanup didn't change the situation. I've just sent the file. Thank you for your project file. We could successfully open your project, also in Word. However, the name of the project is different from the one in your screenshot. Please restart your computer, start Citavi and open your project first in Citavi. Now, start Word and select your project from the list of open projects. Dear Jana, yes I just changed the project name, but it's the same project. I did the procedure you mention already in multiple combinations (opening word first, opening citavi first, but no solution). I should mention that I'm working in a mac through parallels. Could it be a problem of RAM? Currently I have 8GB assigned to the virtual machine. Dear Jana - after increasing the RAM allocated to my virtual machine to 12GB it just opened the file. That might have been the problem all along. I will now try working like this and I will get back to you if there is any further issue. Thanks again for your help - Francesco. Thank you very much for the good news that your project could be opened in Word after you have allocated more RAM to your virtual machine. Depending on the size of a project, Citavi needs more RAM as the project will be again fully loaded to your RAM when you open it in Word. Sorry, back to square one. The project is not loading again. I am desperate at this point. Do you suggest any other route? This post is only for the record. I would like to inform whoever reads this thread in the future, that I have probably located the cause of this problem. This seems to happen, when after installing Citavi and Word in a virtual machine on Parallels (Mac), you try to change the settings of the machine : increase RAM or expand the hard drive's size. I am sorry that you are still experiencing problems with your project in Word. With you project, Word and Citavi took each just 300 MB of RAM on our system. Could you please check in your task manager which other program might need that much space? Please also repair your Office installation. In Windows, switch to the "Control Panel". Select "Microsoft Office [version number]". Select "Modify" and then click "Next". Select "This feature will be installed on local hard drive" for the Word Add-In. Click "Next" and complete the setup process. I did all of this but it’s not working. I’m inclined to abandon this virtual machine and work from a fresh install. I’ll focus my energies on setting up Citavi on the new machine. Dear Jana, after tweaking and updating all the parts of my fresh install (on a new virtual machine), the configuration is working smoothly. I will thus not pursue the problem on the "bad" virtual machine (this one), and will focus on the new one. It's still a mystery why things started going wrong, but I guess we can't always know, especially with Windows. Thanks again for your help, best, Francesco. Thank you very much for the good news that everything is working fine on your new virtual machine!